Mensusa https://www.mensusa.com/articles/a-white-tuxedo-black-lapel-is-ideal-for-party.html A White Tuxedo Black Lapel Is Ideal For Party When special occasions knock at your doors, you are often at a loss regarding your attire and cannot decide what to wear to look the best. Always remember that your clothes speak about your personality as well as your status. So this season, try out a white tuxedo black lapel with matching shirt and pants like the white dress pants and the French cuff shirts with tie. Are you searching for the most unique as well as a smart party wear? First of all visit MensUSA, the best store in town that offers everything unique and outstanding that you can think of. 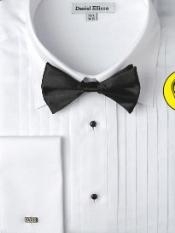 For men who are serious about their style and appearance, the right choice will be the white tuxedo black lapel. Select the ideal dress pants and dress shirt to get a complete look. The black lapel creates the exclusiveness to the attire and changes your total appearance. It makes the wearer look really smart and handsome and naturally far better than others.. Whether you have a white suit or a tuxedo or simply men's white pants. in your wardrobe, you will never be out of style. White color is extremely versatile and matches with all shades of dark as well as light colors. However, choosing the perfect matching dress shirts or the jackets have become easier nowadays, as MensUSA spreads out a variety of matching accessories with the men's white pants. You just need to see whether they fit you well or not. White dress pants are a must-have accessory for every man. You can match it with all colors and can wear for all occasions throughout the year. White dress pants are stitched with utmost care so that the wearer enjoys maximum comfort and looks outstanding wherever he goes. It all depends on the accessories that you choose to wear with your white dress pants. for all colors look decent with white color. But the fit must be accurate so that you can flaunt your personality and dignity on all occasions. 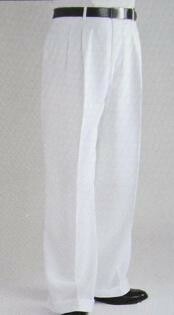 Visit MensUSA for the highest quality white dress pants made of finest linen and cotton. Fashion sense significantly portrays a man's personality. So a proper selection of clothes is very important to maintain status and dignity. White pants for men. is the most essential element in a manâ€™s closet. 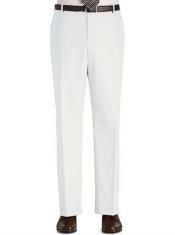 Even if you cannot afford to buy a variety of suits, your white pants can work wonders for you. This is because of the color white. It is in one way sober and in another way gorgeous. When you pair them with dazzling color shirts like red, purple or even gold, you have a gorgeous look. Similarly blue or moss green shirts too look fashionable with the white pants for men. You only need to take care of the cuts and fit of your pants. Do not neglect your dress shirts even if you are wearing the costliest designer suits. Dress shirts are important ensembles of your attire. Even the slightest mismatch of the collar or the cuffs that are visible can spoil your entire look. Try the French cuff shirts with tie that are available in MensUSA to give a boost to your regular looks. The specialty lies in the cuffs that must be worn with appropriate cufflinks or silk knots. They add an extra touch of elegance and style.